Unfortunately, the dress you are looking for (Style: AS-i448265e4, Name: AS-i448265e4) is no longer available. A short shift dress that is appropriate for the office yet lovely for dinner parties after the work day is done is an obvious must-have. This pretty short casual dress is totally professional for the workplace with clean lines and a fresh and airy style. The adorable high-neck dress has beautiful embroidered lace that adorns the sheer-illusion bodice. 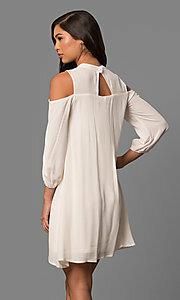 Long sleeves drape over the arms for a trendy cold-shoulder look. The layered cotton gauze dress flows away from the ruffled lace bodice to flatter the figure on this short day-to-night dress. Under $100 for career or casual wear, this short shift dress takes you beautifully from the office to family celebrations while remaining affordable.